Sharp World Clock can show analog clocks (with hands) or digital clocks - or both. You can arrange the clocks in a grid array with adjustable columns and grids or in a horizontal or vertical line, but you can also undock clocks from the main window and position them anywhere on the desktop. To adjust the columns and rows, open the Settings dialog and look for the track bar on the bottom of the dialog. To add a clock, select "Add" (the clock will be duplicated and you can then change its city). To remove a clock, select Remove. To undock a clock (detach it from the main window), select Undock. You can later re-attach it by selecting Dock. When near a border, they "stick" to it, to allow for easier positioning. 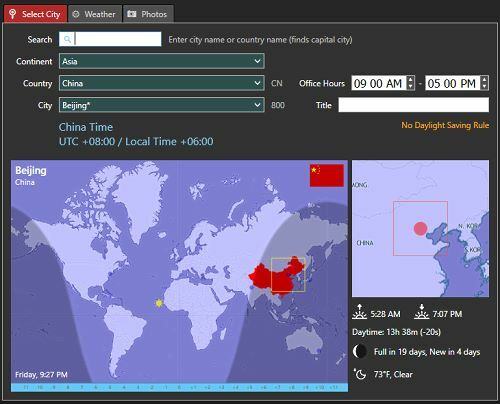 Sharp World Clock contains a database with more than 23,000 cities worldwide (all capital cities and cities with more than about 15,000 inhabitants). The data source for the cities is GeoNames.org and the time zone database comes from IANA.org. You can find the desired city by entering the first characters of it in the search field or by selecting continent, country and city. The search field also accepts country names, if you are only looking for the capital city of a country. You can change the name of the displayed city to any word you choose. For instance, you can enter New York City into the title text field, if you prefer it over the default title New York. Or you can enter the name of the city in your own language or enter the name of a person living in the selected city. The Office Hours (default is 9 a.m. to 5 p.m.) are a tool to remind you of certain conditions within the selected time span, for instance the time you can call someone or a business is open. It shows up in the info popups that appear on mouse over over the clocks. You can also dim clocks during the "out of office" hours - see Global Settings. Every detail of a clock can be changed and adjusted. To simplify the task, there is a gallery with a number of preconfigured design templates where you can see the design live. You can either just apply such a design template to your own clocks or change some of its features, to fit your needs and taste (for instance the color of the city and time labels, to make a good contrast to your desktop color or wallpaper). Browse the settings of the gallery clock you like most and change what you need to. 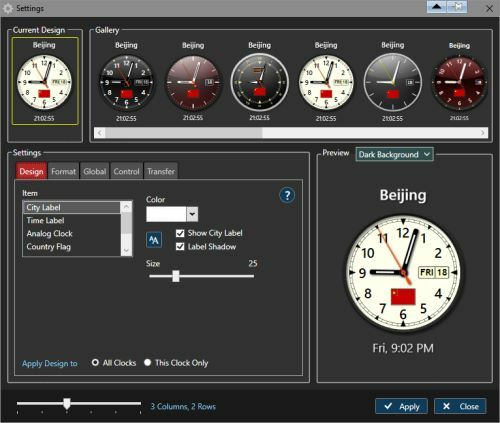 Then you can apply the selected design to all clocks in the main window or to the current clock only. You can add your own design to the gallery or edit and save an existing one. Also you can change the order of the items in the design gallery (buttons appear on mouse hover). Hint 1: The sizes of the city label and the time label are relative to each other and to the clock size. If you want the text of one label bigger, although the value is already at the maximum - just reduce the value of the other slider and vice versa. The size of the clock as a whole is changed with the handle in the bottom right corner (shows up on mouse hover). Hint 2: The transparency of colors can be adjusted in the color dialog by clicking "Advanced" and changing the opacity value from 255 to a lower value, allowing for semi- or fully transparent backgrounds. 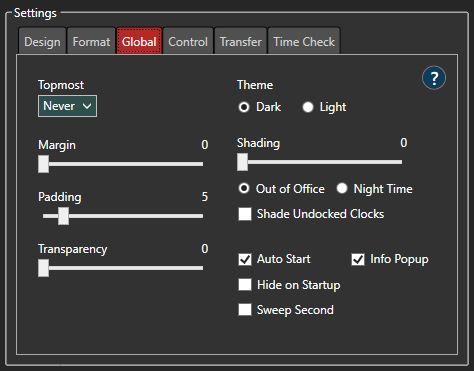 Design changes can be applied to all clocks in your main window or just one. When you open the dialog from a single (undocked) clock, changes apply just for this clock. To change the format in which the digital date / time is displayed, open the settings dialog and select the Format tab. You can select the language for the displayed date / time and one of the predefined date / time formats or assemble a custom format string. The date / time format can be controlled with placeholder strings as shown in the table below. The line break separator allows to divide the date/time string into two separate lines. To control 24h / 12h format, change the language from English / US to English / UK and vice versa (assumed you want English as display language). In the Global section of the settings you can tune the general program appearance and behavior. The third option could be the preferred way for a lot of users (can also be combined with a hotkey). This way you can have one single clock (usually with your own local time) in a corner of your main screen and whenever you need to know the time in other places, you just click it to display the main window with the other clocks. You can transfer your settings from one computer to another. If you only want to export or import some of the above, just unckeck some of the checkboxes and only the desired settings will be exported or imported. 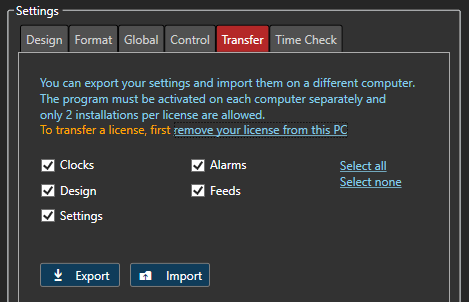 Note that you need to activate the license on each computer separately and only 2 installations are allowed per license (1 for business users). If you want to use a license on a different PC you must first remove it from the PC you are currently using it on. 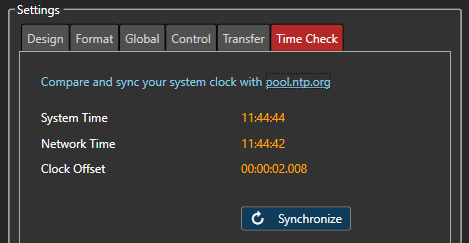 The Time Check section of the settings allows you to compare the system clock of your computer with an NTP (network time protocol) server. There are many such time servers available, Sharp World Clock uses pool.ntp.org. If you find the difference worth correcting, you can press the Synchronize button, so your system clock will be set accordingly. Notice that correcting the clock should not be necessary in most cases, since Windows has a (default) option to automatically synchronize the system clock periodically with an NTP server, so the system clock should not never be out of synch for more than a few seconds. 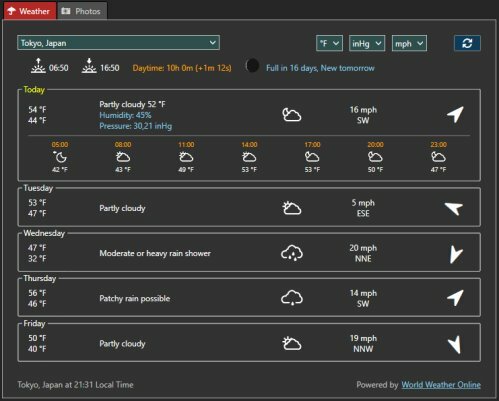 Sharp World Clock includes a weather report and forecast function. The weather data is retrieved from a weather service company and the author cannot guarantee that the service will always be available at any time. For the current day a 3-hours-interval forecast with temperature and weather symbol is displayed, starting 5 AM until 11 PM. You can switch the temperature from °Celsius to °Fahrenheit, the wind speed from km/h to mph and the air pressure to hPa, mmHg or inHg. The sunrise / sunset time is shown along with the lenght of day and the moon phase. Sharp World Clock can show photos of the cities from your clocks. 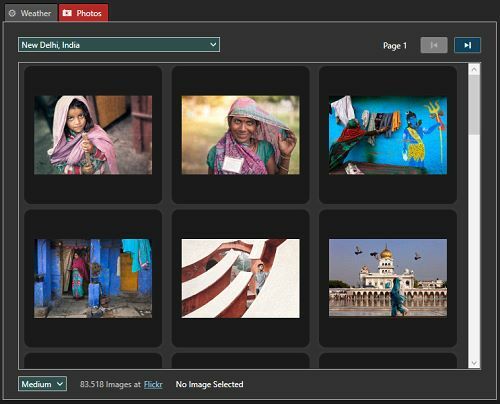 The images are publicly available photos on Flickr.com, which are labeled with the name of the city. Please respect the copyright. Open the City dialog and select the "Photos" tab. On each page there are 30 photos. You can browse the pages and select the size (small/medium/large) of the thumbnails. Click a thumbnail to magnify a picture. 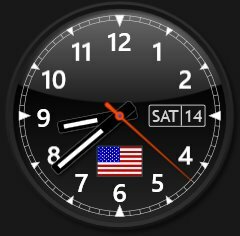 Sharp World Clock shows an icon in your system tray. Not all program icons are always visible, so you might have to click the caret to show them, but you can select the always visible icons in the tray icon settings. Anchor (immobilize) - when activated, the clocks will be anchored at the current position and will not respond to mouse-over and left-click events any more. You can still right-click them to show the context menu.